Even since spending the day at the Juniper & Rose Kitchen Garden School learning more about baking sourdough we’ve been on a quest to obtain more equipment to improve our bread. 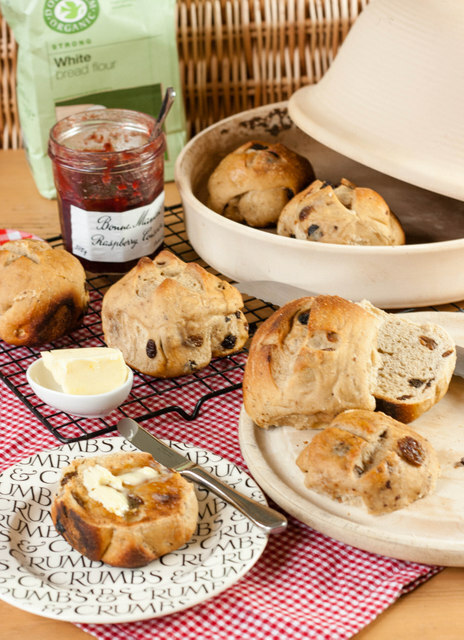 We were sent a couple of items from BakeryBits recently; going through the website, it quickly becomes evident that there are a number of things that we didn’t know we needed, but that would actually significantly improve our baking and breadmaking. Two items in particular have shown themselves to be especially useful: a La Cloche Baking Dome (£47.99) and a Danish dough whisk(£7). The baking dome means that, unlike baking in an oven, my bread is cooking in a contained environment that isn’t vented to the outside air; it’s much more efficient at creating a steamy atmosphere than adding boiling water to a baking dish at the bottom of the oven. The result is a much softer and thinner crust; further experiments are necessary, but I’m finding that removing the lid for the final ten minutes of cooking is giving the best results. The other technique is to bake in a Dutch oven, but I just know that trying to turn out the banneton into a hot cast iron pot with deep sides is likely disaster. The sides of the bottom part of the cloche are quite low, so it’s far less nerve-racking. The dough whisk has quickly earned its place in the batterie de cuisine. It’s lightning fast at bringing together the dough, and unlike using a hand, the young dough doesn’t really stick to it. I’m also find it very good at incorporating salted water after autolysis. I’m sure there are plenty of other utensils that Bakery Bits sell that are equally useful. The dream is to buy a wood fired oven (which they also sell – price on application) for a true artisan bread. Until then, I’m happy trying to improve my technique loaf by loaf. My latest effort are these spiced rolls. 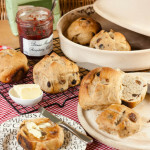 Lovely when halved and toasted, and dripping with butter and jam. If you try this Recipe: Spiced Current Sourdough Buns please tag #FussFreeFlavours on Instagram or Twitter. It is amazing for me when for me when you make one of my recipes and I really do love to see them. You can also share it on my Facebook page. Please pin this recipe to Pinterest too! Thanks for reading Fuss Free Flavours! Mix the milk, reserving 30ml, leaven and melted butter. In a separate bowl, mix the flour, sugar, spices and dried fruit, and then add this to to the milk mixture. Bring together into a dough. Dissolve the salt into the reserved milk. Bulk raise it for about 4 hours, turning and folding every hour or so, adding the remainder of the milk and the salt after an hour, then divided up into rolls for proving. (I made 9 largish rolls, so the mixture would stretch easily to 12 smaller ones); Prove for 6 hours, then bake them in the cloche at gas mark 6/200 degrees for 15 minutes.